Your Evening Wedding Package Includes: • Six Hour Reception • Your own private wedding reception room with elevated head table, cake table , gift table all skirted in white linen • White Floor Length tablecloths for your guest tables and White Linen napkins • White Spandex Chair Covers with Tie (Choice of Color) • Romantic candlelight setting of three votive candles with mirror • Four Hours of Premium Open Bar Package: One-hour cocktail reception prior to dinner Three hours of open bar after dinner • Champagne Toast • Choice of Three Butler Served Hors D’Oeuvres • Five Course Meal • Wine Service with Dinner • Continental Coffee Service • You Provide the Wedding Cake We will cut & Serve for your guests • Complimentary suite with Champagne for the Bride and Groom on the wedding night • Ample free parking Please see attachment for additional information and menu options. 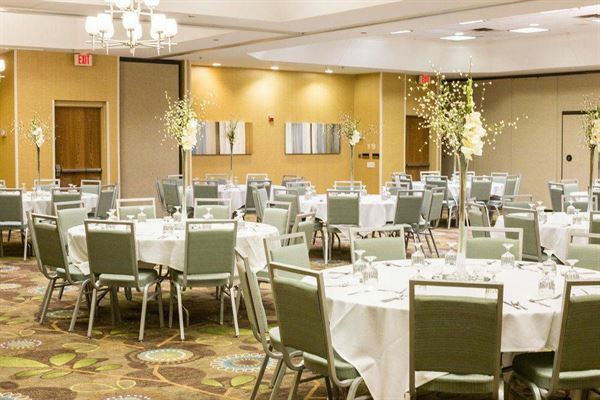 Free banquet room rental with minimum food & beverage purchase. One free meal for every 15 meals purchased $95 Rate for overnight accommodations, plus applicable tax. Whether planning a cocktail reception, A festive holiday buffet or an elegant multi-course meal, Our talented Culinary & Events Team will work with you to ensure every detail is perfect. Custom Menus are our Specialty! • Mini Veggie Spring Rolls • Loaded Potato Skins • BBQ Meatballs • Mini Franks in Puff Pastry • Chicken or Vegetable Quesadillas • Buffalo Chicken Wings • Chicken Satay Kabob • Mini Beef & Veggie Kabobs • Assorted Mini Quiche • Vegetarian Stuffed Mushroom • Maryland Mini Crab Cakes • Brie & Raspberry Filled Filo • Swedish Meatballs • Mini Beef Wellington • Italian Sausage Stuffed Mushroom • Stuffed Artichoke Heart • Seared Tuna on Crostini with Wasabi Sauce • Goat Cheese Puffs • Melon Wrapped Prosciutto • Fresh Tomato Basil Bruschetta • Smoked Salmon Canape • Chilled jumbo Shrimp Cocktail Tempting Displays • Domestic Cheese & Crackers Tray • Fresh Vegetable Crudites • Fresh Fruit Tray • Antipasto Tray with Crostini Please see attachment for additional menu options.